Tennessee Titans rookie head coach Mike Vrabel, who saw his three best players injured in the first game of the season, has found a way to push his team to three consecutive wins. 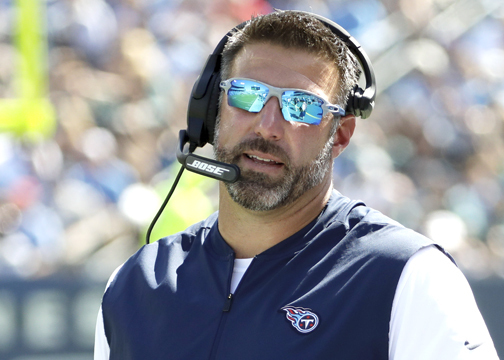 If that’s so, the Tennessee Titans may have found a keeper in Mike Vrabel just four weeks into his tenure as an NFL head coach. In each of his first four games, Vrabel has faced adversity head on, overcome it and used it as a team-building exercise. The tone might actually have been set after Vrabel endured one of the most unusual head coaching debuts in NFL history in Miami. In that game alone – the Titans only loss thus far – Vrabel guided his team through two two-hour lightning delays, watched quarterback Marcus Mariota get knocked out of the game on a questionable hit and throw back-to-back interceptions, lost left tackle Taylor Lewan to a concussion and lost the team’s most productive offensive player from a year ago in tight end Delanie Walker for the season. It was a bleak beginning for Vrabel, the man hand-picked by Jon Robinson to take the organization farther than coach Mike Mularkey could have. Vrabel, in leading the Titans to the top of the AFC South, has proven to be just the right mix of innovator, motivator and caretaker in getting the Titans to buy into his way of doing things. Leading up to the home opener against Houston, it was Vrabel who declared two days before the game that the Titans had to do “whatever it takes” go out and win a football game against the Texans. To everyone’s surprise, his beleaguered team did just that – winning without their quarterback, top receiving target and best offensive lineman. It was Vrabel’s innovation that helped pull the Titans through. He suggested on the day before the game that Matt LaFleur install the wildcat formation during the Saturday walk-through, something Derrick Henry executed to near perfection. That and gutsy fake punt pass from safety Kevin Byard to fellow safety Dane Cruikshank propped up the sagging offense enough for the Titans to win. Through the season’s first month, there is mounting evidence that the Titans believe Vrabel’s way is the right way. Before Game 3 at Jacksonville, it was Lewan who revealed another part of Vrabel’s style that has the star left tackle all-in on his head coach – more so than he had been with Ken Whisenhunt or Mularkey. After he had been cleared from the concussion protocol, Lewan spoke of Vrabel putting his well-being ahead of everything else the week before against Houston. What the Titans are getting used to is finding a way to win – no matter how dire the circumstances. The Titans lost backup QB Blaine Gabbert early in the game in Jacksonville, and they somehow won a field goal game, 9-6, with a limited Mariota forced back into action. And Sunday, the offense not only survived the midweek bombshell of receiver Rishard Matthews quitting the team, but got a vote of confidence from Vrabel in overtime when he chose against trying a 50-yard field goal that would have tied the game. Instead, he rolled the dice and went for the win on fourth down from the Eagles’ 32. Typical Vrabel, says cornerback Logan Ryan, having the faith enough in his team to put them in a position to win. The Titans pulled off the win four plays later on a touchdown pass to Corey Davis with just five seconds left in overtime. Vrabel’s focus is always on the next play, the next game and the next moment. The way things have been going, the Titans can probably expect an early season blizzard next week in Buffalo. But you get the feeling that, given his knack for staring down adversity, Vrabel would find a way to get his team to simply adjust and move forward. “The guys understand that we stay together,” Vrabel says. “Bad things happen – we threw a pick, the defense doesn’t come over to complain. We don’t do something on special teams, we don’t come over and complain, we just run out there and we play defense. “Offense does something positive, we try to feed off of it.